I am thrilled to be setting off on my narrrowboat Mystic Moon this April to offer pop-up death cafes along the river and canal systems throughout the spring and summer months. I am passionate about helping people to talk more honestly and openly about end of life issues, and equally passionate about the UK’s inland waterways. So, it’s a perfect combination. I am also 62, fit and healthy, but I realise unless I do it now, the opportunity to fulfill this long-time dream will disappear. I have no idea what lies in store. But it’s fun (and a trifle scary) to have this golden opportunity to throw myself open to whatever may happen. So, I will be blogging about my adventures, and also about the pop-up death cafes. Mystic Moon is a beautiful 50 foot 1995 vintage Braidbar narrrowboat, lovingly cared for by her previous owner. He reluctantly sold her to me as he had recently remarried and needed more space for joint children and grandchildren. I am so grateful to him for his kindness and generosity during the sale, and delighted that he was so pleased to learn about the pop-up death cafes. 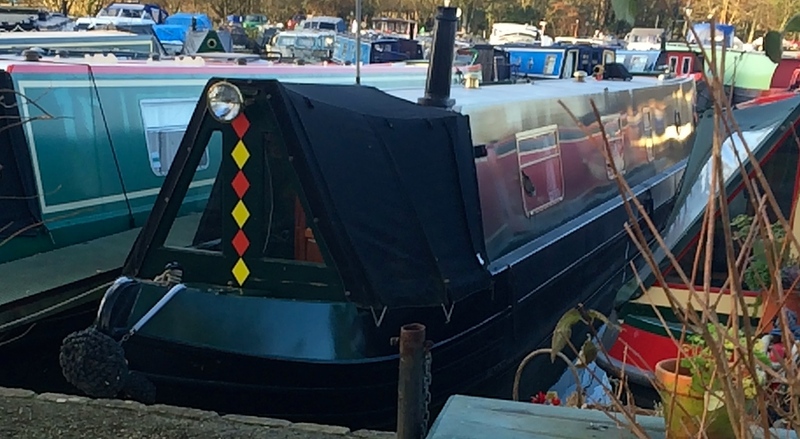 I will be starting from Bradford on Avon (where Mystic Moon is currently moored), offering the first pop-up café on the Bradford on Avon wharf below the lock, on Thursday 9th April, between 2.30 – 4.20. (Please email me to book a place) This pop-up café will be co-hosted by Liz Rothschild, funeral celebrant, green burial manager, and director of Oxford’s Kicking the Bucket Festival. I will be in London during May, and moving up to the Grand Union via the beautiful Oxford Canal during June, so give me a wave if you see me trundling along on Mystic Moon. If you would like to book a place for a pop-up death café, do email me for locations and dates. Please note that Death Cafes are not recom mended for those who have been recently bereaved. Please also be aware that coming aboard will be entirely at your own risk, and access for those who are disabled is very limited. For more information about the cafes, please go to the Death Café website. Depending on the location of Mystic Moon and safe access, you can book Mystic Moon for a pop-up Death Café near you, or I am happy to run them on shore. Just get in touch. This entry was posted in All posts and tagged advance decision, Death cafe, end-of-life experiences, talking about death and dyiing. Bookmark the permalink. You WILL need help to get to London. Don’t try to do it all alone! Fabulous. I would love to have a list of your stops as I might be travelling with my caravan in some of those places at the same time. Denise of Lovingly Managed. I will be posting them on my website and Twitter. Also the will be posted on The Death Cafe website. April, I will be on the Kennet and Avon, May, in London. June, along the Grand Union. July, probably the River Avon and Gloucester. Then back to Bradford on Avon. I do hope to see you at some point.